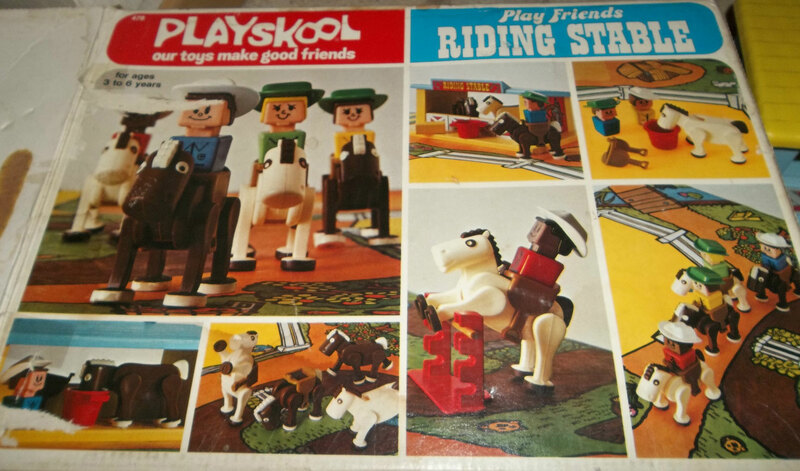 Description: Saddle up the horses, mount up and off you go. There's a "fenced-in" pen and jumping area for exercise, and a road for galloping. After your excursion, lead your horse back into the stable where a bale of hay is waiting for him to nibble on. 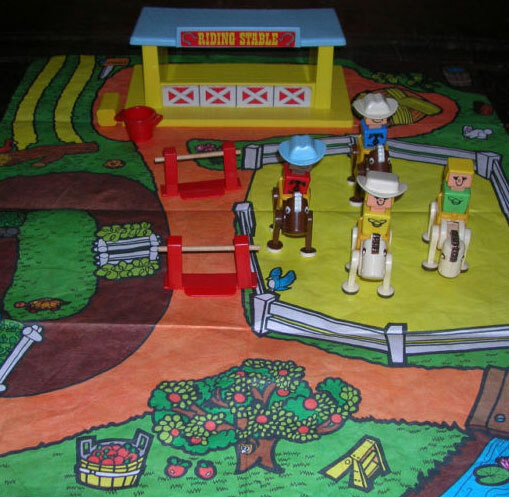 Includes a colorful vinyl playmat, 4 horses, 4 hats, 4 Play Friend figures, a feed bucket, bail of hay, and 2 jumps with adjustable crossbars. 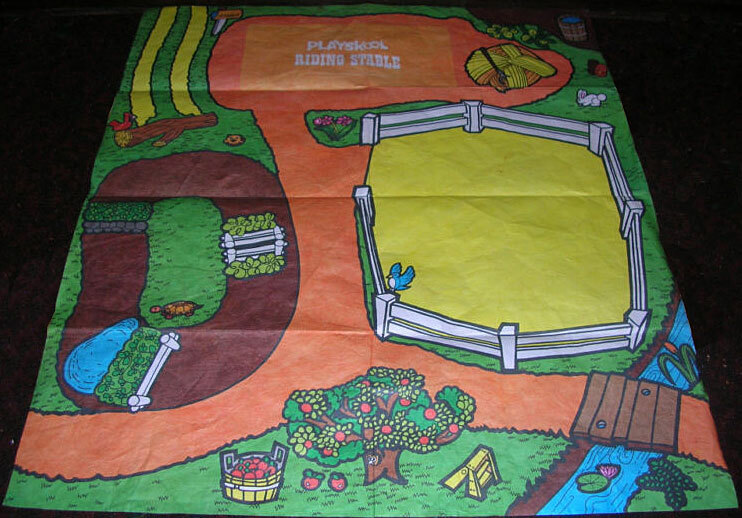 PSK130 - Playmat - 24" x 28" vinyl playmat that includes a yellow yard with white fence on the edges, a dark brown oval track with jumping obsticles, and includes a road and rectangular area marked "Playskool Riding Stable" to place the horse stable onto. The mat includes an appletree with bucket of apples, a small creek in one corner with a wooden bridge, and a mailbox and bail of hay near the stable area. 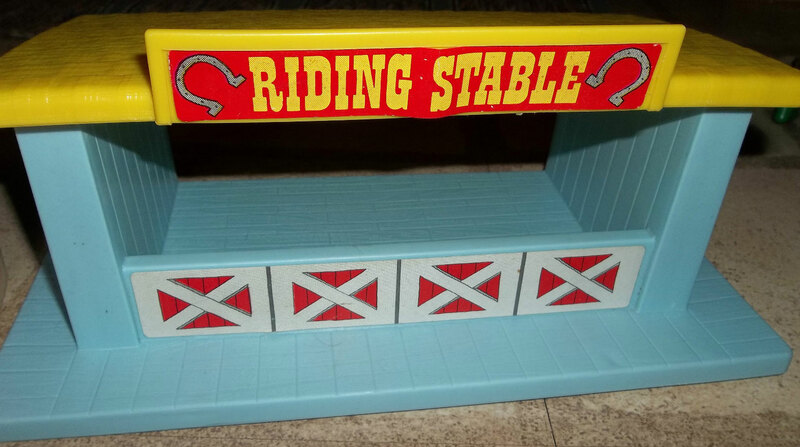 Horse Stable - Plastic horse stable with a wood-simulated rectangular base, 2 upright walls (simulated wood panels), and a rectangular roof with a simulated square hay design. The front edge of the roof has a raised rectangular flat area (for litho sign) and the area under the sign has a short wall with 4 red/white litho barn doors. See "variations" below for color options. Horse Jump - 2 each - PSK131 - Red plastic horse jump base with 2 squared hollow upright support arms. Each arm has 3 U-shaped holes (to hold adjustable crossbars). Horse Jump Crossbar - 2 each - PSK132 - Small wooden dowel that attachs to upright support arms on the PSK131 horse jump base. 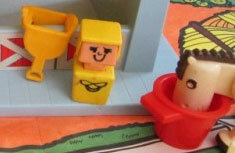 Feed Bucket - PSK133 - Red plastic bucket/pail with 2 small handles (near top rim on opposite sides of bucket). Bail of Hay - PSK134 - Small yellow wooden block with rounded edges. Each end is square, rectangular sides. Horse Saddle - 4 each - PSK119 - Square yellow saddle with a hollow square in the center (seat area) and 2 stirrups hanging down on the sides. PSK135 - Hat - Square white hat with a square hole on the bottom (to fit onto a Playskool figure's head), a wide (slightly curved) brim on the edges, and a flat squared top. PSK136 - Hat - Square light blue hat with a square hole on the bottom (to fit onto a Playskool figure's head), a wide (slightly curved) brim on the edges, and a flat squared top. 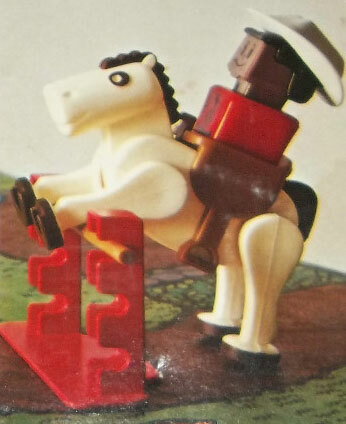 PSK137 - Hat - Square white hat with a square hole on the bottom (to fit onto a Playskool figure's head), a wide (slightly curved) brim on the edges, and a 2 rounded humps on top. PSK138 - Hat - Square light blue hat with a square hole on the bottom (to fit onto a Playskool figure's head), a wide (slightly curved) brim on the edges, and a 2 rounded humps on top. Horse - 2 each - PSK118 - Dark brown horse with a squared body, 4 jointed legs (attached to sides of body), a raised molded white mane and tail, round white hooves, and a white/black eye. Horse - 2 each - PSK139 - White horse with a squared body, 4 jointed legs (attached to sides of body), a raised molded dark brown and tail, round dark brown hooves, and a white/black eye. 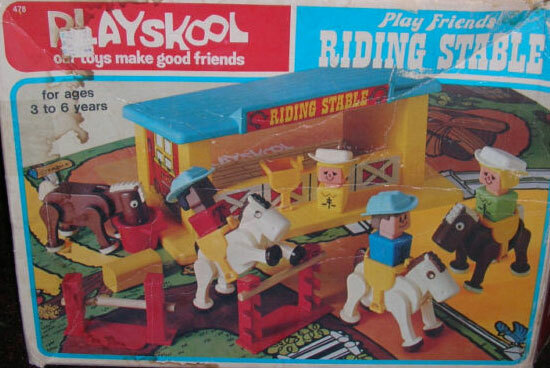 PSK140 - Light Blue Horse Stable with Yellow roof. PSK141 - Yellow Horse Stable with Light Blue roof. Featured in 1975 Sears Christmas Wishbook (page 489) - price $8.94.